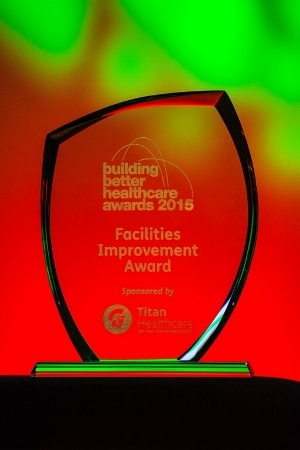 As part of the 2015 Building Better Healthcare Awards, six gongs were handed out in the Estates & Facilities Management category, which recognises and celebrates excellence in the delivery of soft and hard estates and facilities services. 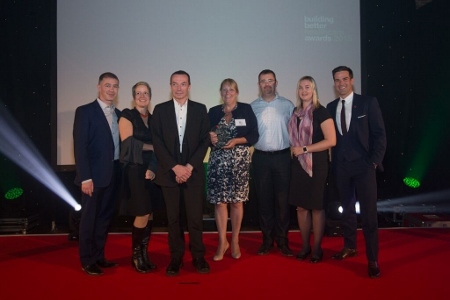 The winners were chosen from more than 40 entries across nine categories, with the judges choosing two winners in the Facilities Team of the Year category due to the strength of the nominations. Prizes were presented by celebrity host, Gethin Jones, and recognised excellence both from partnerships between the public and private sector, and from in-house EFM teams, all charged with enhancing the patient environment while at the same time delivering efficiencies. Red Rose Corporate Services (RRCS) is responsible for managing the estates and facilities operations for Lancashire Care NHS Foundation Trust (LCFT). Over the last five year RRCS has exceeded LCFT’s cost improvement programme targets, resulting in savings of over £5m, including £800,0000 a year through hard FM market testing; £400,000 in savings from soft FM market testing; and rationalisation of the estate by 13%, or 20,000sq m. This alone has saved £2m a year in running costs. Improvements to catering services led to the trust gaining a satisfaction score of 94.52% in the 2014 PLACE inspections, the 12th-highest score for a mental health trust in the country; and a cleanliness score of 98.14%. A holistic portering service means mail, medical records, furniture, and equipment are all delivered in the same vehicles to 700 properties each day, ensuring efficiency in resource and vehicles. RRCS also led the Grow Your Own project as an estates initiative that involves service users growing produce for use in the trust’s kitchens and self-catering ward areas. Wasteland has been developed into a tranquil haven of poly tunnels, a wild flower meadow, and ponds to encourage wildlife, along with a chicken coop for service users to spend quality time away from the hospital and to undertake a range of activities. RRCS was the first strategic estates partnership of its type and has paved the way for similar arrangements based on the same model. 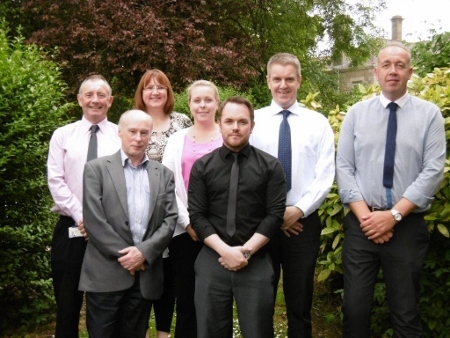 Northumberland, Tyne and Wear NHS Foundation Trust’s capital projects team has demonstrated outstanding work to improve the trust’s estate. The trust inherited a large, very poor-quality mental health and disability services estate and, before its formation in 2006, only 5-10% of inpatient accommodation was in NHS condition A or B. Now, at 90-95%, it is among the best in the country. Thirteen significant new-build and refurbishment developments have been completed since 2006, at a capital value of around £180m, the most recent and largest being the £50m Hopewood Park Hospital in Sunderland, which opened in September 2014. The team’s contribution towards achieving the trust’s strategic objective ‘to modernise and reform services, providing first-class care in first-class environments’ is evident in the consistent delivery of award-winning new developments, providing excellent environments for patients, staff and visitors. The director of estates was also instrumental in establishing and leading the trust’s highly-successful 11-year ProCure21 partnership with Laing O’Rourke, delivering most of these developments. From the outset, the importance of ‘people’ in developing a strong partnership ethos was recognised and continuity of key personnel in both organisations and throughout the supply chain, was a key factor. The team has shown determination to improve the patient and carer experience on all developments, for example commissioning bespoke bedroom doors and signage. 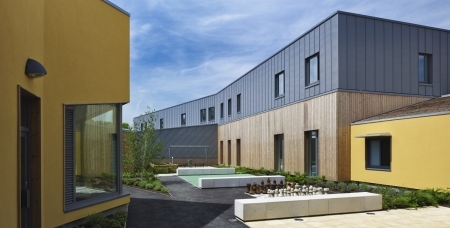 They also worked with ProCure21 partners on innovative construction methods, including using on and offsite modular building techniques for Hopewood Park, resulting in the Construction Excellence North-East Award for Innovation. The judges added: “They team has done a lot to make improvements, recognising that care and the environment are interdependent on each other. The housekeeping department at Ashford and St Peter’s Hospitals NHS Foundation Trust is responsible for catering and cleaning services across the organisation. There are 142 employees reporting to the head of facilities support services. Generic job descriptions have been developed for both ward-based patient food service assistants and cleaners as there are similar competencies. This has enabled cleaners to serve the continental breakfast early in the morning and for food service assistants to start later in the day, working from 10.30am-7pm, which allows for consistency in serving the two primary hot meals. The housekeeping team is one of the most successful in the trust, with the management principles adopted being simple - appraisals, training, rewards and communication. Despite housekeepers being paid on the lowest banding, they are a very well-motivated and happy workforce, evidenced by a recent NHS staff survey. This is based on good and inclusive management principles, such as a robust local induction and refresher-training programme and recognising those who go the extra mile through an Employee of the Month Award. During this year’s extreme winter pressures, the team made an extraordinary contribution to improving the patient experience, with some working as porters in A&E and X-Ray to help get patients through the system more quickly. The University Hospitals of North Midlands NHS Trust project was particularly unique in the healthcare sector in that it involved the simultaneous dissolution of a foundation trust - the former Mid-Staffordshire NHS Foundation Trust - and the overnight transfer of its services, facilities and assets across two sites to the management of the new organisation and The Royal Wolverhampton Hospitals NHS Trust, with rapid service integration immediately following that. The timeframe for such a process was also particularly challenging, with the detailed planning and implementation for the transition being less than six months. Furthermore, both trusts were undergoing significant change to manage rising local clinical pressures. 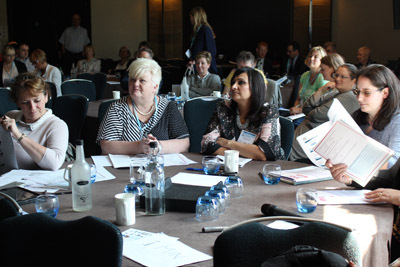 Working collectively and in partnership, representatives from each trust openly shared complex and detailed information – using this to review existing EFM service structures across the two hospital sites at Stafford and Cannock. Through this enterprising methodology and open partnership working, the team was successful in developing and delivering a seamless transition of services on time, as planned, and with no impact on patients. 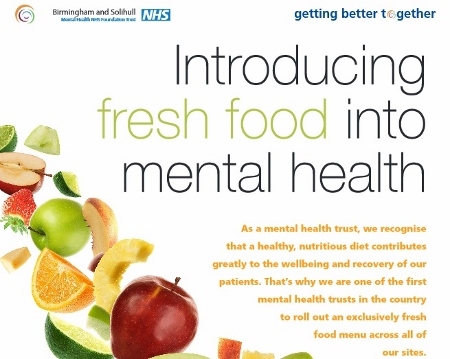 Birmingham and Solihull Mental Health NHS Foundation Trust is committed to delivering outstanding facilities support to service users and staff. Over the past couple of years its commitment to service improvement has led to a number of key enhancements, all informed by patient and staff feedback. These include the trust being named a ‘Centre of Excellence’ by the British Institute of Cleaning, with the appointment of its own accredited assessors; the use of fresh food throughout all catering services; the launch of an ‘introduction to professional catering’ course for service users; and a partnership with St Basils, providing FM work experience for ex-homeless service users. The trust has also improved its cleaning policy with the ‘Strictly Come Cleaning‘ initiative; and has devised an in-house managed general and non-emergency transport service. A trust spokesman said: “We have a committed management hierarchy that believes in the development of our 300 staff, valuing style and personality differences and offering clear leadership goals. The facilities management team recently completed the mighty Ben Nevis 24-hour charity challenge, raising £5,000 in the process. The trust’s Food Champion initiative sees the catering team attend regular patient forums and undertake satisfaction surveys. Service users are also involved in menu decisions. Other interventions include the introduction of a rapid response decontamination deep cleaning team. University Hospital of Morecambe Bay Catering Services has worked tirelessly over the past 12-18 months to improve, not only the patient experience while in the hospital, but also to support clients within the wider community. Over the past 12-18 months the team has worked closely with celebrity chef, James Martin, to completely revamp the menus. This has enabled the catering service to provide wholesome, nutritional food on a budget, helping patients on the road to recovery. The team has recently launched a bulk service which enables the catering staff to take full control of the service, from delivery of the wagons to the wards, to the catering staff serving the food at ward level. This gives them the opportunity to have contact with the ward staff and helps support the patient mealtime experience. It has also helped the trust to reduce food waste and gives patients the opportunity to request more food if they are still hungry. The recently-launched community meals service is a vital option that enables people to stay in their homes, or if they are ready to be released from the hospital means they can have traditional homemade food delivered to their door by a team of dedicated volunteers. 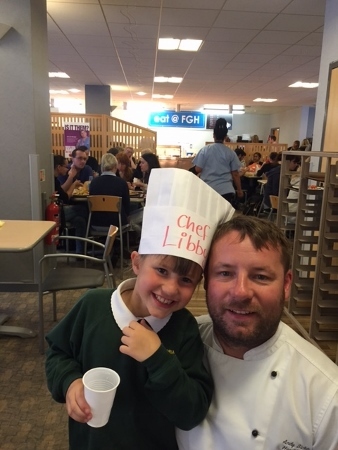 The head chefs within the trust have worked in partnerships with some of the local schools to promote healthy eating with youngsters helping to design the children’s ward menus. The trust has also introduced picture menus for more-vulnerable patients, including those with autism and dementia. Finally, the catering services team has just launched ‘to-go bags', devised in conjunction with dieticians, hospital matrons, and a local supplier. Given to patients free of charge on discharge from hospital, they contain items like tea, coffee, sugar, biscuits, UHT milk, and bread. These basic essentials are vital to ensure patients have adequate food and drink when they return home. Capita Health Partners in partnership with Sussex Community NHS Trust: a new approach to sustainable healthcare In February 2014, Sussex Community NHS Trust approved a new, holistic sustainable healthcare strategy, known as Care Without Carbon (CWC). This sets more-challenging sustainability targets forward to 2020, with the trust hoping to become the first carbon-neutral NHS provider in the UK. Its seven-step management framework covers buildings, journeys, procurement, culture, wellbeing, adaptation, and governance and transformation. The strategy dovetails into strategic and operational initiatives to embed sustainability into core operations. The project can deliver a CO2 saving of over 5,000 tonnes between now and 2020, with cumulative cost savings of around £4.75m. “Sustainable healthcare starts with a plan, but is delivered by people, which is why engagement matters,” said a spokesman for Capita, which is working with the trust on the programme. The team has established a network of Carbon Champions, is working with suppliers to reduce the environmental impact of its supply chain; and has launched a staff engagement campaign. The scheme has improved energy efficiency by 15.6% and water efficiency by 54.9% since 2010/11; has reduced business miles by 500,000 and cut fleet vehicle emissions by 17.6%. Recycling rates have increased to 68% last year; and the trust has started to map the potential effect of climate change on its buildings. Other trusts are now beginning to adopt the same approach. Sue Ryder engaged Jane Darbyshire and David Kendall architects to revamp the Grade I-listed Thorpe Hall, one of the best-preserved Cromwellian mansions in England. The new inpatient unit provides 20 single en-suite bedrooms with support accommodation and is conceived as a pavilion set within formal gardens. Jane Petit, hospice director, said: “From the moment anyone comes into the new building, the changes the environment has helped to deliver are palpable. The garden design creates a series of outdoor rooms, each with its own character. Every bedroom has direct access to the gardens with level access and a door wide enough to bring beds outside. A pergola shades the southerly windows and, externally, elevations are softened with natural cedar shingles and muted plasterwork. The whole building is covered by a sedum roof. 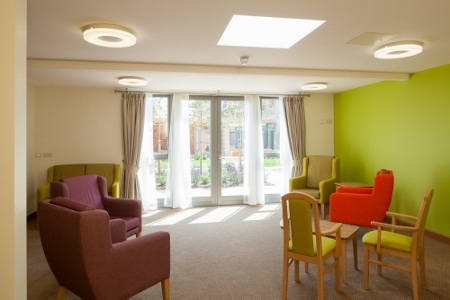 Internally, the architects worked with hospice staff to create bright and colourful interiors that enrich the therapeutic environment. The unit is constructed from a highly-insulated timber frame and underfloor heating is powered by a ground source heat pump. Together with low-energy lighting and ventilation, the building should emit 20% less carbon than Building Regulations require, with significant cost savings. 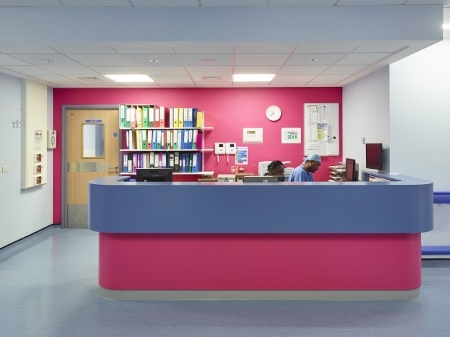 The Our Changing Hospital project at Lister Hospital provided a new emergency department, ward block, theatre suite and endoscopy and chemotherapy unit to consolidate acute inpatient services onto one site. An approach to future patient needs and future phases of development, and a complex blend of new and refurbished buildings, has been achieved, all while clinical services have been in operation. There was a single team approach throughout the consultation, design and construction processes and each individual project had a clinical director lead to ensure focus remained on clinical benefits and the patient experience. The team also held 164 patient, staff and public meetings, with over 2,000 items of feedback. This led to them receiving the national NHS Communications Award. As a result of the initiative, patients are now treated closer to home, with reduced hospital admissions. Bringing together clinical expertise into consolidated services also improves healthcare outcomes. The project supported the delivery of £24.6m worth of savings in 2015/16 and the hospital has surpassed the NHS target carbon emission target two years early. Backlog maintenance costs have also been reduced by £20m. Ryhurst has achieved £2.1m savings against overheads, cost avoidance, lease and maintenance costs and a 40% reduction in space on behalf of Lancashire Care NHS Foundation Trust (LCFT) via a space utilisation programme. Ryhurst and LCFT entered into the first Strategic Estates Partnership (SEP) of its kind in the NHS in 2010, with a focus on delivering efficiencies and generating savings from the estate. As part of the partnership, Ryhurst undertook a review of the trust’s existing facilities and identified 16 buildings which formed a pilot space utilisation study, from which recommendations for improved use were provided. 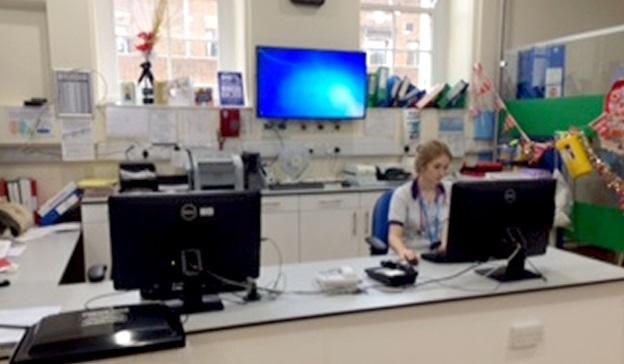 From this study Ryhurst’s space utilisation team has improved the working environment for trust staff within 13 corporate facilities and two clinical facilities, while at the same time ensuring optimum efficiency of space and flexibility to accommodate future requirements. Due to the success of the initial space utilisation programme, LCFT has since identified the need to continue reducing the amount of space it uses in both corporate and clinical facilities, and Ryhurst has helped by procuring and installing room monitoring sensors to ensure accurate data is captured about how rooms are currently used to identify how and where they can be used more cost effectively. The approach is now beginning to be adopted by other trusts with Ryhurst recently submitting a proposal to support the Isle of Wight NHS Trust. The healthcare sector spends more than £700m a year on waste disposal. How waste is managed has a direct impact on the bottom line - poor management potentially exposes hospitals to unforeseen health risks, vast overspending, and disruptions to the vital life-saving services they provide. It is crucial, especially within the sector where every department is interconnected, that every healthcare establishment is responsible for managing its waste effectively and sustainably by understanding the true value of the waste they create and which solutions works best for them. Since 2012, GPT Waste Management has worked with Ramsay Health Care UK to improve everyday working practices and to generate significant savings. Initially GPT undertook site visits to investigate the existing waste practices across each of the facilities. The results highlighted that several thousand tonnes of waste was produced every year, of which 72% was being sent to landfill. This was costing Ramsay UK nearly £1.3m a year. This detailed analysis prompted the urgent need to work closely together to improve waste handling, focus on the better segregation of waste, and to provide expert training. By working with service providers, GPT has increased the overall landfill diversion rate to 97% since 2012. This has reduced spend by over £235,000. 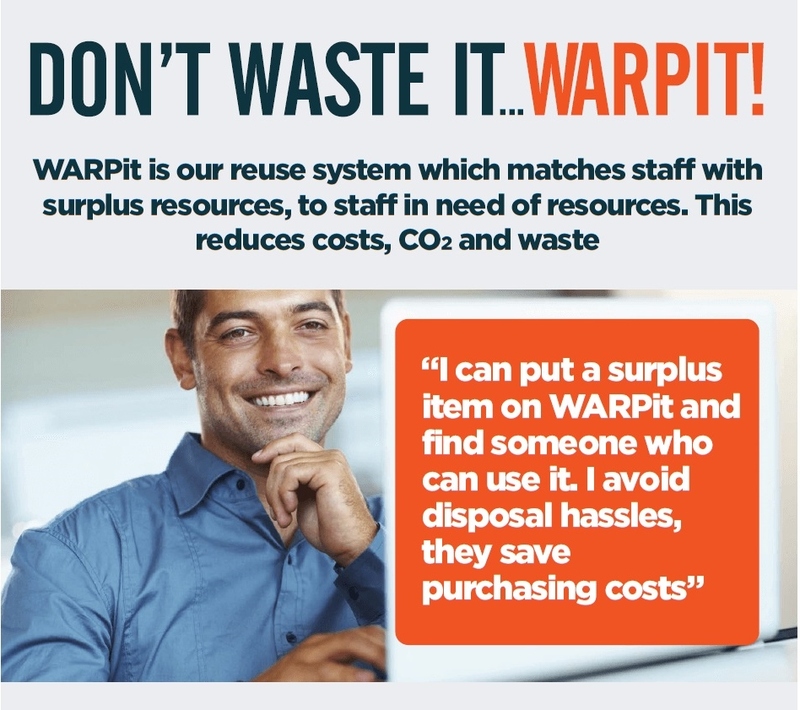 The Warp It Reuse Network is an online trading platform that allows staff to get, give, and loan surplus assets within the organisation and even between organisations. Working like eBay or freecycle, the service makes it easy for purchasers to check whether anyone in the organisation, or beyond, has an item already surplus. Warp It has saved customers £4m in avoided procurement and has facilitated the donation of £400,000 of assets to charity. Warp It counts about 30% of the NHS as customers. NHS Tayside was one early adopter and for the past two years has been part of the Warp It asset sharing network. “Waste is a big issue for us and we could see this scheme would solve a problem ,” said Andy Hay, procurement planning manager for NHS Tayside. The scheme took a year to bed in at NHS Tayside and collaboration between procurement and facilities managers was critical to make it work. To date, the trust has achieved over £75,000 in total cost savings and 10,895kg of waste has been avoided. Greater Manchester West Mental Health NHS Foundation Trust has been using the service for two months and has saved £25,000; and Cheshire and Wirral Partnership NHS Foundation Trust has been using it for just over a year and has saved £115,000 in avoided procurement and waste costs. Warp It is so confident of the savings that it guarantees a return on investment of at least five times in the first year. Continuing on the successful implementation of the Hospital Support Assistant(HSa) Phase 1 project in 2013/14, Northern Lincolnshire and Goole NHS Foundation Trust has now implemented the HSa Phase 2 project, which looks at all aspects of domestic services across Diana Princess of Wales Hospital and Scunthorpe General Hospital. The project objectives included delivering efficiency savings, improving services, standardising operating procedures across all sites, implementing performance management tools, and improving staff morale. The outcomes include a full-year cost improvement of £91,000. Changes in job titles and descriptions mean staff are now more flexible across locations and teams, and there has been a reduction in overtime hours and staff turnover, and staff previously on temporary or fixed-term contracts have been transferred to permanent positions. Handbooks were developed for staff to help them in their new roles and dashboards give feedback and performance scores for the department. This engages the staff to understand hours worked, sickness levels, and the percentage of worked hours by staff group. 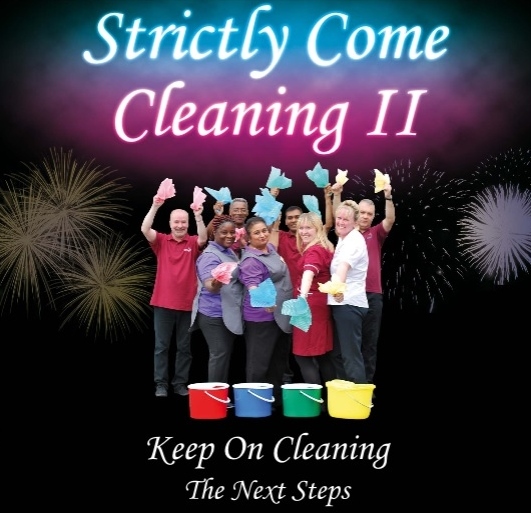 On 20 October 2014, Birmingham and Solihull Mental Health NHS Foundation Trust’s new cleaning policy was launched with the high-profile, innovative and highly-successful Strictly Come Cleaning II campaign. 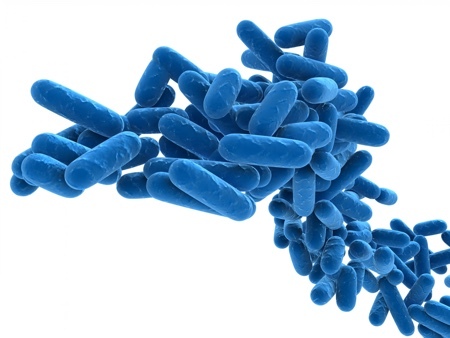 This aimed to raise awareness of the policy’s vital message that a clean environment is critical to controlling infection. The campaign was a collaboration of the trust’s in-house and PFI partner’s facilities teams, infection prevention and control team, lead nurses, matrons, and patient representatives. It culminated in the trust’s executive director of nursing presenting awards and reinforcing the importance of environmental cleanliness and the essential role of domestic staff. 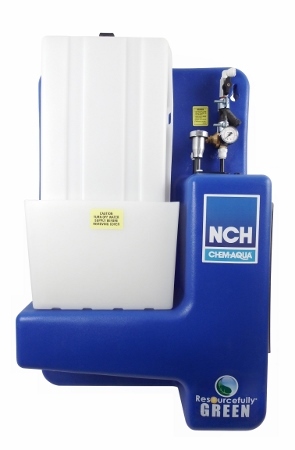 The policy provides clearly-defined responsibilities for cleanliness of all aspects of the trust’s environment. As well as increasing awareness of the crucial role of domestic staff, and the value placed upon them, the campaign increased the trust’s internal cleanliness score to 98.5% in 2014-15 from 97% in 2013-14. Its PLACE cleanliness scores also increased, with 96% of inpatient units scoring 100% in 2015 compared with 58% in 2014.